Flat water racing could be regarding as one of the club’s “Specialist Subjects”. There are a significant number of very experienced racers in the club including Duncan Blyth (ex World Cup champion from 1989) and, more recently, Sam Rees-Clark (Marathon and Sprint) and her brother Mike Rees-Clark (Wild Water) who are currently representing GB. All racing paddlers start at the bottom and work their way up to the level that matches their ability given the time and commitment that they can give to the sport. At BCCC we are always looking to bring on new racers and develop their potential so if you think you are interested then contact one of our experts below. Paddlers in Divisions 7, 8 and 9 race over a course of about 6.5km (4 miles). Divisions 4, 5 and 6 race over a course of about 13km (8miles) and Divisions 1, 2 and 3 over 20km (12miles). Despite being referred to as marathon racing, only the most able competitors at national and international level, paddle over the traditional marathon distance of 26.2 miles. If you are under 12 then you can enter races in boats called Lightnings, which are strong, stable craft ideal for young people under 12 years old and under 60 KG. The distance raced is typically 2 miles. Every regional Hasler race has events for Lightnings in the Under 12 and Under 10 categories for both boys and girls. The actual distances may vary a little from event to event, largely due to the safe and accessible length of water available to race on. Most races in Divisions 1-6 have portages which means you have to get out of your boat and walk or run whilst carrying your boat around the obstacle such as a weir or lock before getting back into your boat to continue the race. If there is no natural obstacle, an “artificial” portage is inserted. There are usually no portages in the Div 7-9 races. Very few racing paddlers use a standard asymmetric paddle. All our racing paddlers use the wing paddle blade from the start of the Introduction to Flat Water Racing course and in training. The Club has a large assortment of wing paddles available in various lengths and sizes for members to use before they opt to purchase their own. If you are under 16, you must wear a buoyancy aid for a race as well as in training and all paddlers ranked in Divisions 9, 8 and 7, whether they are under 16 or not, must also wear a buoyancy aid when racing. These are held all over the country throughout the year, usually on Sundays. Competitors have an official Marathon Division Ranking from 1 to 9 or Lightning Class. New competitors start in Division 9 (or Lightning Class for those Under 12), and progress through the divisions by winning their race or achieving a time that would be competitive in the next higher division. 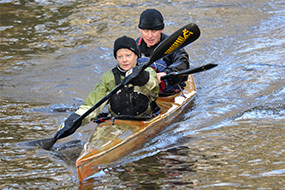 To find out more about marathon racing in Great Britain, go to the Marathon Canoe Racing UK website. The Hasler Trophy racing season is from April to the end of October. Each participating British Canoeing-affiliated club is in a region. We are in the Southern region. Clubs in each region offer to run a race in the Hasler series championship. Clubs in that region enter their paddlers in each of the Hasler races within their region and they gain points for their finishing position in their race i.e. winner 20 points, second 19 points and for K2 crews; winner 40 points etc. Points per club are gained at each race and the top 4 clubs in each region then compete at the Hasler Final in September where they meet other clubs from all around the country. Details of our local races can be found in the Races section. Flat water racers do not expect to fall in so a wet suit will be too hot and uncomfortable (even in winter) and arm movement could be restricted. For newcomers to flat water racing advice on what to wear can be found in the details for the Introduction to Flat Water Racing Course. Get in a boat and paddle! Details of these courses can be found on our flat water racing training page. The BCCC flat water racers train formally to a pre-determined schedule on Tuesday and Thursday evenings at 18:00 and on Saturday at 09:30. Informally, groups of paddlers of similar ability may come together for training at other times by agreement. Further details are here. As part of the training schedule there is a Hare & Hounds event on the third Saturday morning of each month. Paddlers race against the clock over 2, 4 or 6 miles and, hopefully, improve their times with training and the coaching that we can provide.